Here in the States, New Year’s is characterized by showers of champagne, lofty new year’s resolutions, and midnight ball drops. Needless to say, the United States has a flair for ringing in the New Year. 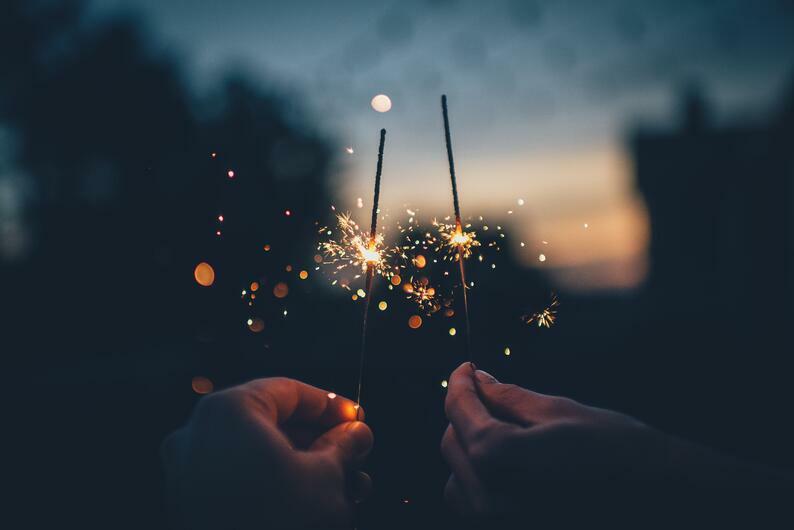 As we settle into this new year, there’s no better time to turn our lens outward to NYE traditions around the world. Oshogatsu (Japanese New Year) is a three-day national holiday in Japan, celebrated with time off of work, family reunions, and traditional rituals. Although Japan follows the 12-year cycle of the Chinese Zodiac calendar, the New Year is actually celebrated on a different day: January 1st. Sound familiar? The holiday was moved to this date in 1873 when the young Meiji Emperor changed it from its traditional date to align with the Western nations in an effort to modernize Japan. This change sets Japan apart from China, Korea, and Vietnam, which celebrate the New Year based on the Chinese lunisolar calendar. Let’s turn our attention over to our friends in Japan and see how they celebrate the year's most important holiday. In Japan, each year is viewed as a separate entity, so none of last year’s baggage should carry over into the new year. All old business must be taken care of before the year’s end — all debts must be paid, all arguments settled, clothes must be washed, the house must be cleaned, and all meals for the celebration must be prepared in advance. Don’t even think about leaving that sink full of dishes for the new year, or putting off paying your bills until mid-January — it's bound to bring bad luck in the New Year. Fortunately, Oshogatsu is a national holiday, so you’ll get three to four days off of work to begin your preparations. Unfortunately, this also means that all stores and businesses will be closed during this time, so you’ll have to purchase what you need in advance — that includes stopping by an ATM! It’s safest to assume that everything — and we mean everything — will be closed during Oshogatsu, so plan ahead. 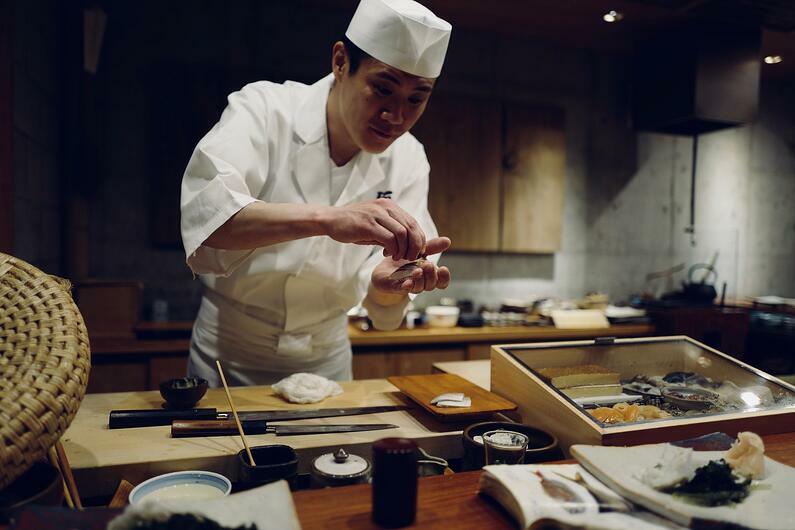 Oshogatsu calls for a special menu centered around good fortune, and it tastes as good as the luck that it brings. The food for this special holiday is called osechi ryoori and each dish is designed to last for several days at room temperature without refrigeration. With stores closed and Japanese families reveling in the holiday, the meals must last for several days. The New Year's celebration calls for a delectable cuisine of specially prepared vegetables, fish, and rice, cured in salt or vinegar or simmered in sweetened soy sauce and sake, designed to last through the holiday. Certain dishes are trademark to this Japanese holiday, and many hold a special meaning in their New Year's traditions. Ebi — This dish of prawns represents a long life, as the curve of the prawn’s body resembles an elder’s curved back. Kuromame — These black soy beans symbolize hard work and healthy living. Tazukuri — Dried sardines cooked with soy sauce, the kanji is literally 'rice paddy maker.' Sardines were historically scattered as fertilizer for the rice harvest, and it now symbolizes hope for a good harvest. Kuri kinton — Sweet chestnuts, the literal meaning of the kanji for kinton is 'golden dumpling,' and they symbolize wealth. Renkon no Sunomono — Lotus root vinegared salad, this dish symbolizes Buddhism. Toshi koshi soba — These New Year’s buckwheat noodles can be served in hot soup or chilled with a separate dipping sauce. The long noodles symbolize longevity and health. Traditionally, these soba noodles were eaten before midnight, but today, many families eat them in the early hours of New Year’s Day before going out to visit a temple. 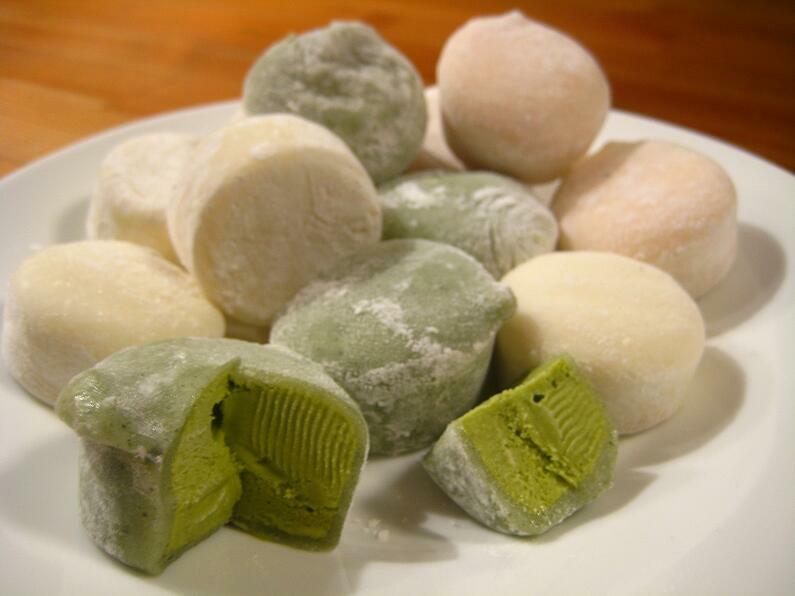 A Japanese New Year staple, mochi is a rice cake made from pounded glutinous rice. Traditionally, one must eat mochi on New Year's or face a year of bad luck. Mochi is a crucial part of the holiday’s preparation and it’s a notoriously stressful process that requires several people working together. Mochi making is known as mochi tsuki. Though some continue to prepare mochi the traditional way, many now use a mochi-making machine instead, called a mochi tsukiki. Although food is an important part of Oshogatsu celebrations, it is equally important to visit a temple at the arrival of the new year. Some of the more famous temples, like the Meiji Temple in Tokyo, receive several million visitors a day at the start of the new year. This customary temple visit is called hatsumōde and takes place in the first three days of the new year. 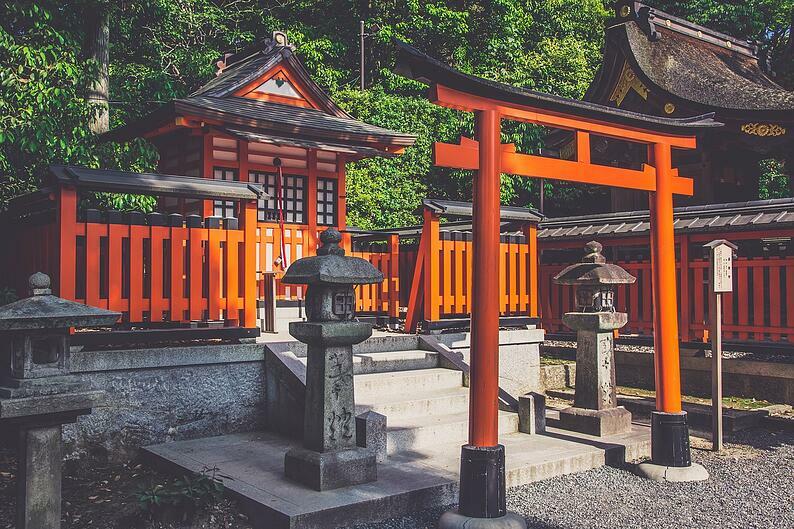 Visitors can bring in last year’s good luck charm and trade it for a new one, and many people choose to wear full kimono — a rarity in modern Japan. On New Year’s Eve, crowds of people gather at local temples to hear the traditional joya no kane, 108 bell tolls that are thought to purify humans from the 108 evil desires identified in Buddhist teachings. Not unlike New Year’s celebrations in the West, Oshogatsu is a holiday spent with close friends and family. 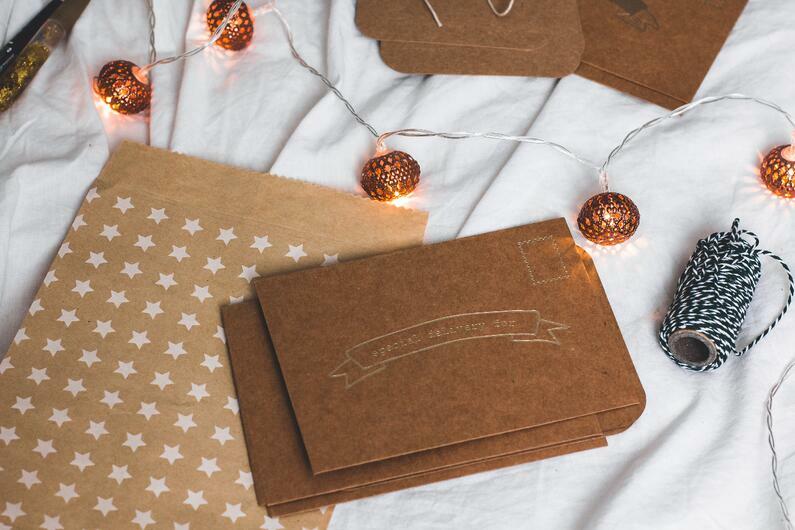 During this special time of year, children receive a particularly exciting gift — beautifully decorated envelopes of cold, hard cash from family and friends. 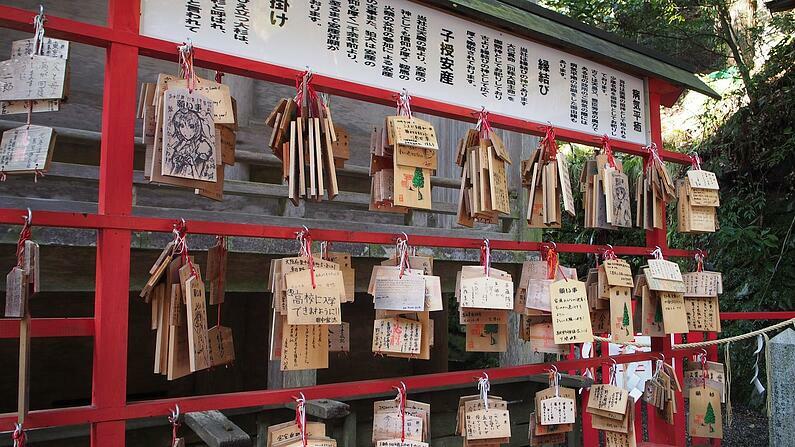 This tradition, known as otoshidama, can add up to $200 – $300 per child. So if you were wondering how kids feel about Oshogatsu, they’re pretty big fans. But kids aren't the only ones receiving gifts for the new year. Throughout Japan, friends and family send each other traditional New Year's Day cards. Many of the cards are linked to a New Year's Day lottery that gives away electronics, money, and small prizes for the holiday. These cards are called nengajo and they’re marked to be delivered on January 1st — no exceptions. If you’re in Japan during Oshogatsu, make sure to thank your mail carrier — they’re practically the only ones working on January 1st. Although Japan now follows the Gregorian calendar (the calendar system used in the U.S. and Europe), they traditionally followed the Chinese zodiac cycle. The nengajo are printed with the new years' zodiac, bringing a sense of novelty and excitement each year with the unveiling of each new design. One of the most popular nengajo sold in Japan was in 2015, the year of the Sheep. It featured an adorably smug sheep, proudly sporting a finished scarf that it started knitting nearly a decade ago, a callback to Japan’s 2003 New Year's stamp design. Several years later, the Sheep revealed that it had indeed finished its new year's resolution. Happy Oshogatsu, from us to you! Looking to kick off your new year's resolution? Finally learn to speak the language you love and explore 70 other world languages, just for fun. Click below to get started on your goals! How do you celebrate the new year in your family? Are there certain traditions you have? Please share them with us in the comments below or give us a shoutout on social!